Not Hours. Attractive and Durable for Years of Trouble-Free Use. HORIZONTAL Style  Reads left to Right. Compact 3/8 Design Indexes a Standard Bible in Only 2 Rows, Making Books Easier to Find. Bible Index Tabs Rainbow by G T Luscombe is published by Ritchie Christian Media. 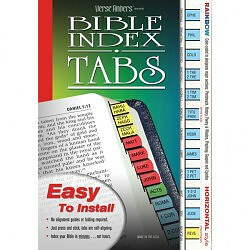 The ISBN for Bible Index Tabs Rainbow is 658788000141. Be the first to review Bible Index Tabs Rainbow! Got a question? No problem! Just click here to ask us about Bible Index Tabs Rainbow.